For quite a long while, the hearts of AMD fanciers have been confused by the rumors of the forthcoming release of inexpensive processors for Socket 939. Anyway.. rumors are just rumors, but computers made by largest European and American manufacturers started being shipped with quite an interesting novelty - a new value processor Sempron with 939 pins. You could even hold such processors in hands already the past year. 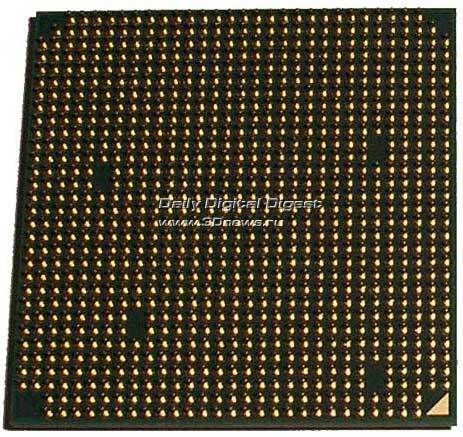 We could get only "ghosts" because once released they immediately disappeared, and officially the manufacturer doesn't produce processors cheaper than Athlon 64 3000+. Sempron for Socket 939 in only in AMD's plans. On the other hand, the emergence of such chips is highly promising. Having bought a modern Socket 939 system with a value processor at small money, the user might probably wish to upgrade just the very processor as a bottleneck to Athlon 64 X2 which has gone down in price. In fact, AMD would sell two processors and not one to the same buyer. But Sempron 939 is not released officially - which means there are reasons. Now we'll try to look for the reasons the existence of the existing processor is negated. At our test lab, we received a few of such "ghosts" marked as AMD Sempron 3000+ Socket 939. Interestingly, the processors came from various sources and at different times - that has affected the style of narration and number of authors of the material, as well as the specifics of tests and results, but we're talking about that a bit later. On the other hand, we succeeded in running a comprehensive test session and compiling a small overclocking statistics. But first let's look into the specifications of the still inexistent series of processors. Since officially there is not specification for the processor, the above information was acquired from an unofficial source called Internet, so there is not absolute confidence in its authenticity, but all our processors match the specifications. Another mystery was the name of the processor core. Judging by the detected and available marking of the processor cores, they are at least three. Following the tradition, AMD assigns a new name to each new core which has even slightest differences from that in use. Those used to be horse breeds, today they are city names, but it is hard to tell something certain regarding our specimen. Judging by the letter endings, these should be Winchester and Venice of different revisions. Info utilities either keep silence about this item or are definitely mistaken, or detect the core as the one belonging to Athlon 64 3000+, although the processors differ in L2 cache sizes substantially. There is one thing we can state with confidence - the product was made through hardware-level disengagement of 75% or 50% of L2 cache in the "parent" core. The manufacturer disables not other units, so the processor preserves all the technologies typical of a full-featured Athlon 64 - i.e. Cool'n'Quiet and instruction set. Based on the marking, the processors which came to our test lab can be divided into two types. 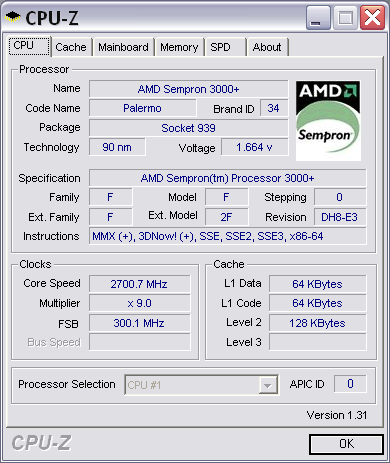 SDA – AMD Sempron Desktop. I - Operating voltage – 1.40 V.
О – maximum temperature of the housing is presumably reserved at 70°C. 2 – L2 cache size 128 K.
That different cores can be used as the base for the processor may be somehow an unpleasant surprise to the buyer. For instance, the Winchester of which the Sempron SDA3000DIO2BI is perhaps made does not support SSE3 instructions. Although that is not critical since there aren't so many applications optimized for these instructions, admit it the fact is not very much pleasant because some have got more for the same money. The probability of occurrence of this or that implementation of processor is equivalent. In view of the increased demand for the product, you've got to take what is there to get something. 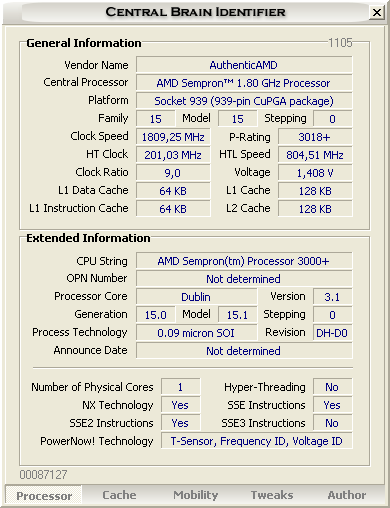 Such a variety of processor cores inside the Sempron 939 line can be explained by one assumption. It is very likely that these processors were made of Athlon 64 scrappage having partially inoperative L2 cache memory and released into sales (to be more precise, into the assembly process from where it then leaked to sales) only once the "scrappage" was accumulated in sufficient quantity. From the bottom line you can see the date of manufacture of the processors. There is one more mystery. The processor on the base of Venice core was made earlier (on the 25th week of year 2005, i.e. in June this year) than the processor based on the older Winchester core (on the 35th week of year 2005, i.e. in August). Perhaps our assumption on the origin of unofficially released Sempron 939 has one more reason. 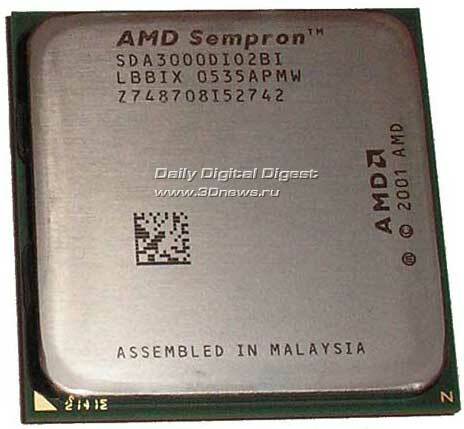 Externally, Sempron and Athlon 64 for Socket 939 look very much alike - the package of the processors is absolutely identical, and you can tell them apart only after reading the labels. Viewed from the bottom, you can tell these processors apart at all since the housing structure does not imply any additional components - they simply can't be positioned anywhere among the so numerous pins. After the visual examination, let's move on to exploring the interior features of the processors. Let's start with the common CPU-Z utility. Unfortunately, the screenshots were taken with different versions of the program because it was updated between the change of processors on the test bench. That's the information we acquired on the first processor marked as SDA3000DIO2BP. As you see, CPU-Z 1.30 was unable to correctly detect all the parameters, but by the set of instructions used we can say there's kinship to the Venice core. Emergence of the second processor coincided with the release up update to CPU-Z, so we were able to produce a more detailed information. 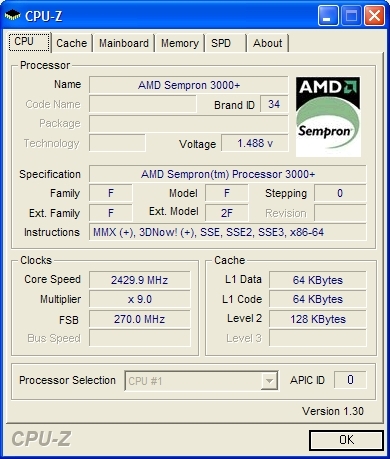 The utility says that the system uses a Sempron Socket 939 but reports the name of the core from Athlon 64. Note the lack of support for SSE3 instructions with which the first examined processor could run. Another CPU info utility (CBI, Central Brain Identifier) identified the processor core as Dublin which belongs to mobile processors. As you see, each program identifies the processor in its own way. At that, the research was not over - once the second stage of tests was complete, we were presented two more processors marked as SDA3000DIO2BP. This time, the utilities reached a consensus - that is Palermo, the core of Sempron for Socket 754, is akin to Venice. Despite another evident error, the result is quite logical since E3 stepping was identified, which points to the improved memory controller and support for SSE3 instructions. Perhaps, enough theory, let's move on to practice and look how good our "guinea-pigs" are. We ran the test in three stages. First we had one processor for a while, so the first stage was run on a hastily assembled test-bench for express comparison versus nearest competitors - its direct "parent" Athlon 64 3000+, and versus a rival from Intel's camp - Pentium 4 531 (3000 MHz). All the three had one thing in common - "3000". 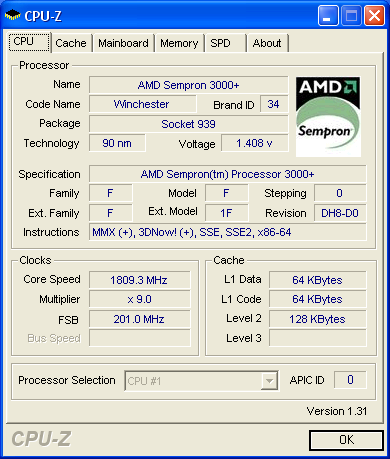 In the case of AMD - that is rating 3000+, and with Pentium 4 that is its true clock speed 3000 MHz. We tried to prove its overclocking capability, but the result was not very impressive - the first try was unsuccessful - merely 2429 MHz (the screenshot that confirms it is shown a bit above, in the description of the processors). Judging by the statistics picked up in the Net, the result is far away from the desired, but perhaps it's hard to make more from Microstar K8N Diamond. While the results produced during the tests of the first processor were being processed, we got the second Sempron 3000+ Socket 939 that came from a different source and had a different marking. This processor was running unhurriedly, so we chose another test-bench and conducted one more test session aimed at the study of all performance aspects and comparison versus the full-featured Athlon 64 because the choice often has to be made just between these processors. Also, the overclocking capability of the processor pleased us more, perhaps it is due to the advantage of ASUS A8N-SLI Deluxe motherboard. The new result was 2569 MHz. At that, our compilation of statistics through personal experience was not over. 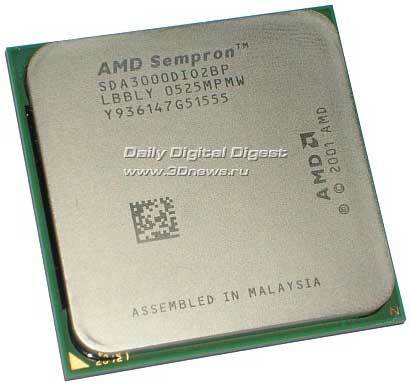 Remember that just before the issue of the material we found two more Sempron 3000+ Socket 939 processors. This time, the task was different - to achieve the maximum overclocking. So, armed with DFI LanParty SLI-DR motherboard and the cooling system ICE-HAMMER IH-3775VW, we produced the following results. First, we were able squeezing 2610 MHz out of the first processor and attaining a stable operation. Then, having replaced it with another processor, we succeeded in attaining the cherished 2700 MHz. As you see, the overclocking capability strongly varies from processor to processor and motherboards. In any outcome, the performance boost is guaranteed. Then we are smoothly moving on to measuring the performance numerically. Results for these test systems will be presented on the graphs in green tints. Results produced for this system will be presented on the graphs in blue tints. Every time we switched the test benches, we installed MS Windows XP Service Pack 2 on a clean hard disk and left the default settings untouched. But wherever possible we updated all the drivers to the latest versions. Another distinction between the test benches was the video driver - for Gigabyte NVIDIA GeForce 6800 we used NVIDIA ForceWare v.81.84, and for Gigabyte NVIDIA GeForce 6600GT the driver was updated to NVIDIA ForceWare v.81.85 WHQL. Traditionally, we start with the synthetics. First there go the results produced with the popular benchmarking package SiSoftware Sandra 2005. Since Sempron and Athlon 64 are identical in the interior, the speeds of integer and real number processing as well as running multimedia operations are identical. Of interest is the result of memory subtest at which Sempron proved a bit faster. We decided the extend the set of fully synthetical tests with the increasingly popular CrystalMark benchmark. At the same time, we decided to test the package itself and verify its suitability for future materials. The consistency of results in CrystalMark is a bit worse than in SiSoftware Sandra 2005 (which we didn't like at all), so on the graphs we brought in the averaged indicators for three launches of this package whose suitability is doubtful a bit, although the test algorithms are better adapted for the interpretation of real performance. We'll be waiting for new versions to come and hope for an early emergence of the final build. Coming back to the processors, we note that overclocked Sempron keeps showing performance boost up to 30%, which is nice, and Athlon 64 rushes forward at the nominal speeds due to greater L2 cache size. Archiving a big test pack of files was done with 7-Zip 4.29 and WinRar 3.51. WinRar proved demanding for not only the processor's clock speed, but to the L2 cache memory size. Therefore, only the Sempron overclock could equalize the performance. With 7-Zip all is simpler, since its algorithm is more sensitive to the clock speed, so overclock gave a 20% boost, and a 7% lag at the nominal speeds. Since WinRar proved more sensitive to the processor's architecture, we used it to compare the architectures of AMD and Intel, but the set of test files was simplified. The result remained unchanged for AMD and again proved correctness of assigning the ratings (Athlon 64 showed the same performance level as Pentium 3 531 running at 3000 MHz). Now we are moving to media encoding. First we convert music from wav into mp3 using the popular codec LAME under the two settings options - maximum quality with fastest bit-rate and use of the alternative preset "-extreme". We observed a weak dependence of the encoding speed on the L2 cache size, as well as a substantial acceleration of running this operation during overclocking. Now on to video encoding. We took a 5 min. long MPEG2 video clip and tried reducing its size with VirtualDub 1.6.11 and various codecs. In so doing, the audio stream was left unchanged. Again, we see a weak dependence of performance on L2 cache size and effective correction of the situation through overclocking. 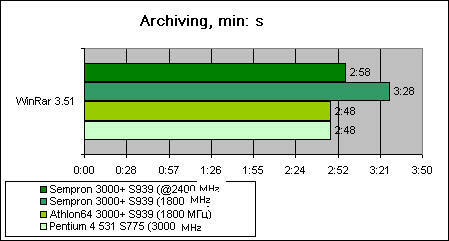 Comparison versus the competitor was done only using the DivX 5.2.1 under standard settings, because this codec is the most popular and many users apply it without changing the settings. The trump of Intel processors at handling audio/video data is beaten by Sempron overclocking. Without overclocking, AMD processors definitely lag behind. Another important aspect of using workstation is 3D modeling and CAD/CAM systems. The averaged indicator in SPECViewpref 8.01 reports a weak dependence of successful operation in 3D Studio Max, Maya and other packages on the size of L2 cache. At Cinebench 2003, the results repeats. The results of general system tests by Futuremark are summarized in one graph. Both versions agree in the opinion that Athlon 64 runs faster with the RAM but differ in the estimation of performance of these processors. We still trust more to PCMark'04 because the latest hotfix to PCMark'05 seems to have fixed all the flaws. Now a little bit of gaming synthetics. The results of 3DMark 2001SE for the video card already show less dependence than the processor and memory, because it shows a superb alignment of forces just for this combination on different platforms. The results are self-explanatory. The package 3DMark'05 is more topical for estimation of the gaming suitability of platforms. Judging by the results, Sempron 939 should be a tasty morsel for thrifty gamers. Test results for Quake 3 Arena have the same status as in 3DMark 2001SE and show the same result. Modern games are perhaps the most interesting aspect for most readers of this material. Running Half-Life 2 did a fine job placing the force vectors, showed the need for greater L2 cache size and effect of the clock speed on the game process, as well as outlined the superiority of the video card of the first test bench. In Doom 3, lack of three fourths of L2 cache takes out as much as 16% of performance, which is not that little. Again, overclocking saves the day. In Far Cry the performance difference between Sempron 939 and Athlon 64 939 falls within 8-9%. At standard frequencies we see a significant but not disastrous 10% lag behind Athlon 64, and overclocking increases performance by 25%, which allows overtaking Athlon 64 by 13%. The tests end with Battlefield 2 where the alignment of forces is not changed. The processors that underwent tests showed a high potential under the most optimum price/performance ratio to date. At the same time, they offer a good overclocking capability! No wonder why these processors are so popular. AMD has always been good at value processors since the times of Duron up to today's Sempron. Sempron 939 proved no exception. The tested processors showed outstanding results. 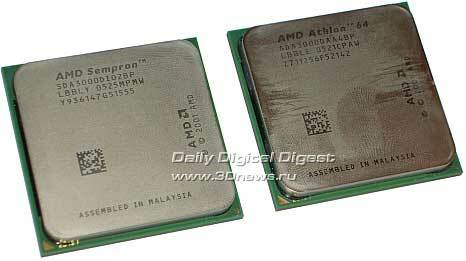 At the same time, they are twice as less in price versus Pentium 4 531 and cost much cheaper than Athlon 64 3000+. Again, the architecture of AMD processors has demonstrated a minor dependence of operating speed on the L2 cache size, which can't be said about the competitors - Intel Pentium 4 as compared to Intel Celeron D. Even though AMD Sempron for Socket 939 has almost no shortcomings and the price of the offering makes it the best choice, the processor is in a very uncertain position - physically, it is there, but not legally. Let's try to assume why things are just this way. In the beginning of the article, we said that AMD is thoroughly hiding information on the existence of inexpensive processors for Socket 939 giving its customers no information on the new product. It is hard to substantiate the established situation - we can name as many options as we like, but in our view one of the most logical reasoning would be the following. As you remember, the platform Socket 754 was a replacement to the outdated Socket A which moved to the low-end market. Gradually, Socket 754 turned a value platform that takes an interim position between the Socket A which is coming to a demise, and the promising Socket 939. We believe there is no need to explain why the lion's share of AMD's profits is made in the value sector of the market. Regarding that, it is reasonable to assume that the new Sempron 939 will produce a negative effect on the old platform thus degrading the popularity of Sempron 754 in the value sector for which a huge number of processors and motherboards are produced today. Considering the excellent performance ratings, it could be a serious rival to the lower-end Athlon 64. Perhaps, guided by these thoughts and trying to avoid unnecessary problems, AMD is not making an announcement of Sempron for Socket 939. For now. The situation may seriously change after the start of mass use of the Socket M2 platform when Socket 754 will have to take the present position of Socket A, and Socket 939 will cease to be the basis for most powerful solutions. We only have to wait, and in the end time will tell what happens. Генерация страницы: 0.103 с. Всего 8 запросов к базе.